Not only were there a record number of entries in the annual KSCB Chili Cook-off, 19, but attendance to the event also saw a record number of people buying tasting kits. Over 425 tasting kits were purchased this year, with the proceeds benefiting Big Brothers, Big Sisters, and Whirlwind Career Counseling and Guidance Center For Veterans. The tasting kit money along with the entry fee money and other miscellaneous donations totalled $655.00 for each organization. 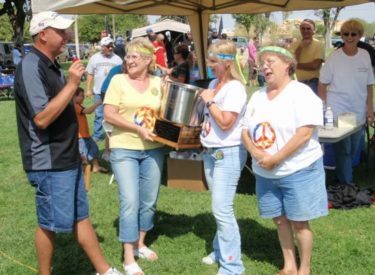 Over the entire time that KSCB has been hosting the Chili Cook-Off, several local Not For Profit Groups have been the recipients of the proceeds from the event as KSCB gives 100% of the money to local organizations.